Hidden away among the non-descript stacks of the State Library is a large, but unassuming series of books. 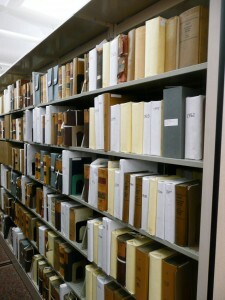 You’ll find around 8000 volumes dating from the beginning of the republic to the present. Many are old and musty, with crumbling bindings bound with cotton tape, or wrapped in paper; others are brand-new, colorful and appealing. Some contain texts of exceedingly boring reports or lists of expenditures of government agencies long-gone. Others contain engaging narratives of exploration, survey, experimentation, or military operations. When I began work here as the Government Documents Librarian, I was unaware that such a series existed, but now I am thoroughly aware of their importance and am working to expand the library’s holdings. The Series I’m talking about is the United States Congressional Serial Set and book-for-book, it’s probably the most important series in the State Library’s Federal Documents collection. That’s saying something, because our entire Federal Documents Collection comprises around 1.8 Million titles. What makes the Serial Set so important? In a nutshell, it is essentially an encyclopedic history of the United States, published, for the most part, as that history was happening. The Serial Set was, and is, the embodiment of the US Congress’ effort to inform the citizens of this country what was happening in the government and the country. Long before the establishment of the Federal Depository Library Program, the Congress “ordered to be printed” books that contained official reports to and from the Federal Government. 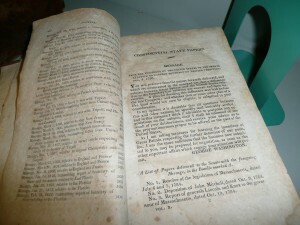 The books were then distributed by the Congressmen back to their home states, constituents and libraries. 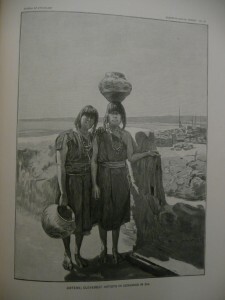 It might have been slower than telegraph, newspapers or even some published books, but it contained factual information about such things as the military conquest of Mexican territories in 1847, surveys for railroad routes to the Pacific in 1855, or the ethnographic studies of the Pueblos of New Mexico in the 1880’s. The list goes on-and-on and fills in a lot of details that are missing in most citizens’ understanding of American history. In addition to bound volumes in the Serial Set, the State Library also has access to digital copies of the Serial Set through Read-Ex that span the years from 1789 to 1980 that patrons may search and download or print as needed. We also have microfiche from 1789 to 1888 and library users are now able to save microfiche and microfilm images as .pdf’s. As many researchers know, fiche and film copies can often cut off parts of pages, or be illegible. In those cases, they can appreciate our growing collection of original volumes for comparison. Come check out the Congressional Serial Set at the State Library!